Lemon rice is a tasty and tangy dish which comes from southern parts of India. This South Indian lemon rice dish is a quick and easy dish to prepare when you are in a hurry. 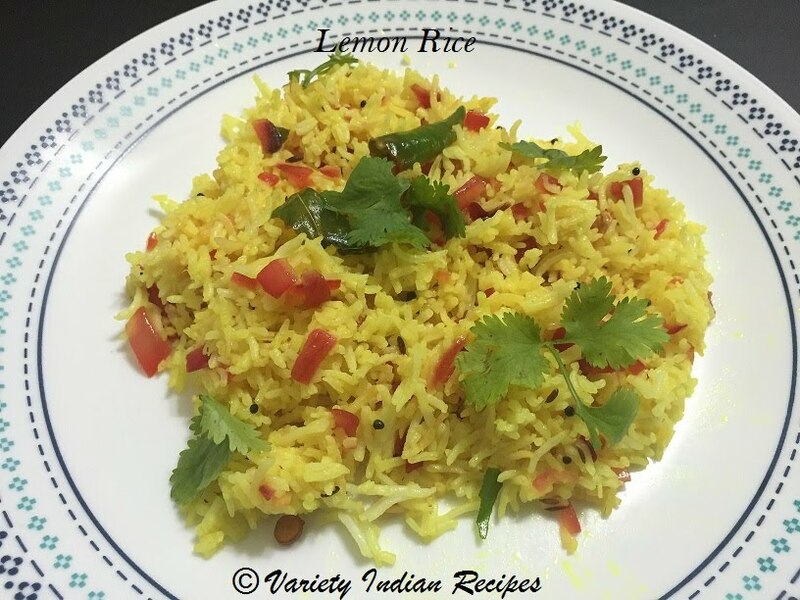 This can also be made with leftover rice, so whenever you have some leftover rice and thinking what to do with, this quick lemon rice comes handy. It is one of the most common lunch box dishes. Slice onions and finely chop garlic and ginger. Heat oil in a pan add mustard seeds, after they splutter add cumin seeds, peanuts,channa dhal. When channa dhal turns slightly brown add urad dhal, red chillies and curry leaves and saute until urad dhal turns slightly brown. Now add onions , green chillies and finely chopped ginger and garlic, fry till the onions become translucent. Add the lemon juice,followed by salt, turmeric powder and immediately add the cooked rice and mix well.